He is a first generation American of Assyrian decent. His father was born in the Northwest Iranian town of Urmia and his mother was born in Baghdad, Iraq. He has been a professional musician, composer, and producer since 1976, focusing extensively on improvised music, free jazz, contemporary composition, and international musical forms. He has collaborated extensively with contemporary theater, dance, and other multidisciplinary forms and has received three Joseph Jefferson Awards for Original Music Composition in Theater, in 1996, 1998, and 2000. He has over forty titles in his discography and has toured nationally and internationally since 1981 with and ever-widening pool of collaborators. He was the artistic director of the Link's Hall Performance Series from 1985-1989 where he produced over 300 concerts of jazz, traditional ethnic folk music, electronic music, and other forms of forward thinking music. He continued to produce concerts at Cafe Urbus Orbis from 1994-1996, and since 2001, at his own space, The Candlestick Maker in Chicago's Albany Park neighborhood. He has taught as a guest artist at The School of the Art Institute of Chicago in performance technique, sound design, and sound/music as it relates to puppetry; rhythmic analysis for dancers at The Dance Center of Columbia College, Northwestern University, and Moming Dance and Arts Center; courses in Composer - Choreographer Collaborations at Northwestern University; music to children at The Jane Adams Hull House. 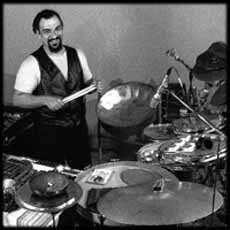 He has held workshops in improvisational music and percussion technique and teaches private lessons in rhythmic analysis, music composition, and percussion technique.